Pakistan is located in southern Asia. Pakistan is bordered by the Arabian Sea to the south, Iran and Afghanistan to the west, India to the east, and China to the north. Google Earth is a free program from Google that allows you to explore satellite images showing the cities and landscapes of Pakistan and all of Asia in fantastic detail. It works on your desktop computer, tablet, or mobile phone. The images in many areas are detailed enough that you can see houses, vehicles and even people on a city street. Google Earth is free and easy-to-use. Pakistan is one of nearly 200 countries illustrated on our Blue Ocean Laminated Map of the World. This map shows a combination of political and physical features. 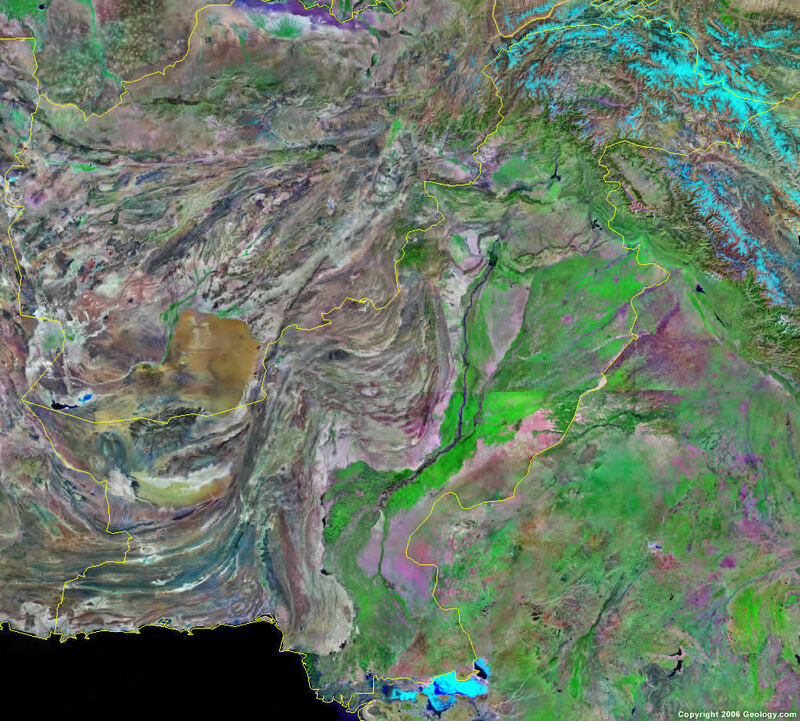 It includes country boundaries, major cities, major mountains in shaded relief, ocean depth in blue color gradient, along with many other features. This is a great map for students, schools, offices and anywhere that a nice map of the world is needed for education, display or decor. 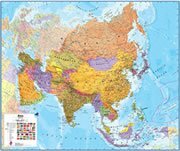 If you are interested in Pakistan and the geography of Asia our large laminated map of Asia might be just what you need. It is a large political map of Asia that also shows many of the continent's physical features in color or shaded relief. Major lakes, rivers,cities, roads, country boundaries, coastlines and surrounding islands are all shown on the map. Abbottabad, Bahawalpur, Bannu, Bela, Chaman, Chitral, Dadu, Dalbandin, Dera Ghazi Khan, Dera Ismail Khan, Faisalabad, Gilgit, Gujranwala, Gujrat, Gwadar, Hyderabad, Islamabad, Jacobabad, Jhang Sadar, Jhelum, Jiwani, Karachi, Kasur, Khuzdar, Kohat, Lahore, Lala, Larkana, Lasht, Londi Kotal, Mand, Mansehra, Mardan, Mingora, Mirpur Khas, Multan, Murree, Muzaffarabad, Nawabshah, Nok Kundi, Ormara, Panjgur, Parachinar, Pasni, Peshawar, Port Muhammad Bin Qasim, Quetta, Rahim Yar Khan, Rawalpindi, Sahiwal, Saidu, Sargodha, Sialkot, Sibi, Skardu, Sukkur, Surab, Tank, Thal, Turbat, Wana, and Zhob. Pakistan has 4 provinces, 2 autonomous territories, and 1 federal territory. Balochistan, Khyber Pakhtunkhwa, Punjab, and Sindh. Azad Jammu and Kashmir and Gilgit-Baltistan. Arabian Sea, Sonmiani Bay, Chagai Hills, Chenab River, Dasht River, Gomal River, Gwadar Bay, Hamun-i-Lora, Hamun-i-Mashkel, Himalaya Mountains, Hindu Kush Mountains, Hingol River, Indus River, Jhelum River, Karakoram Range, Kech River, Kunar River, Makran Coastal Range, Mashkal River, Mouth of the Indus, Nal River, Nara Canal, Nihing River, Rakhshan River, Rann of Kutch, Ravi River, Siachen Glacier, Siahan Range, Sonmiani Bay, Sulaiman Range, Sutlej River, Thar (Great Indian) Desert, and Zhob River. Pakistan has extensive natural gas reserves; however, the country has limited petroleum and poor-quality coal. Other natural resources for this country include arable land, copper, iron ore, limestone, and salt. Pakistan experiences frequent earthquakes that are sometimes severe, particularly in the northern and western portions of the country. Other natural hazards include flooding along the Indus River, after the heavy rains of July and August. One of the many environmental issues for Pakistan is the limited natural freshwater resources. According to the CIA World Factbook, the majority of the population does not have access to potable water. Also, there is water pollution from agricultural runoff, raw sewage, and industrial wastes. Issues for the land include deforestation, soil erosion and desertification. Air pollution is also a problem in urban areas.